REDUCED FEE ! ! This highly sought after, corner one bedroom one bath apartment is DUMBO loft living at its apex. REDUCED FEE!! This highly sought after, corner one-bedroom/one bath apartment is DUMBO loft living at its apex. The N line at 205 Water Street strikes a balance between privacy, airiness and light. It boasts delightful eastern and southern exposures through its six over-sized casement framed windows with double layered insulated glass. This unit features a flexible and voluminous living and dining space that effortlessly opens to the gourmet kitchen. The kitchen is a chef's dream with stunning Carrera marble countertops and backsplash, contemporary slate gray cabinetry, Sub-Zero refrigerator, Thermador range, microwave, Bosch dishwasher, 27-bottle wine cooler and extra deep sink with garbage disposal. The spa-like bath features a beautiful marble topped walnut vanity, an oversized soaking tub, Italian porcelain walls and floors and basalt stone accents. While the spacious master bedroom has three show stopping windows and two closets. Rounding out this pristine home is a Bosch washer/dryer, Nest controlled heating/cooling system, 5-inch wide fumed oak flooring, 9'5" foot ceilings and window treatments. Beyond that, the N unit shares no common walls for maximum quiet and privacy. And a separate private storage is included. Shared amenities include full-service staff with 24-hour doormen, resident manager, landscaped courtyard, in-building parking garage, second-floor terrace, indoor lounge with bar and media area, fitness center, bicycle storage, refrigerated storage and laundry room. 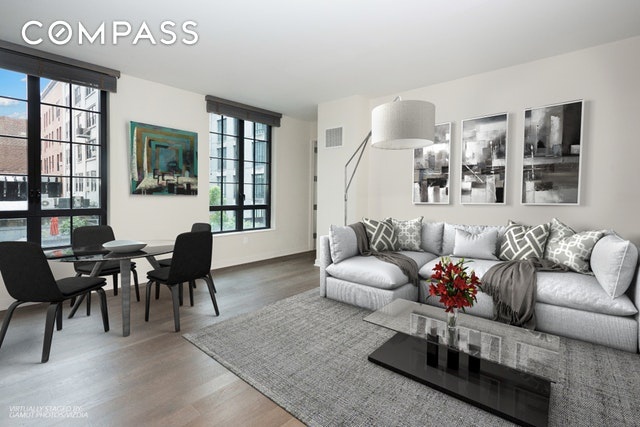 THIS HIGHLY SOUGHT-AFTER, CORNER ONE BEDROOM, ONE BATHROOM APARTMENT IS DUMBO LOFT LIVING AT ITS APEX! The N line at 205 Water Street strikes a balance between privacy, airiness, and light. It boasts delightful eastern and southern exposures through its six over-sized casement framed windows with double layered insulated glass. This unit features a flexible and voluminous living and dining space that effortlessly opens to the gourmet kitchen. The kitchen is a chef's dream with stunning Carrera marble countertops and backsplash, contemporary slate gray cabinetry, Sub-Zero refrigerator, Thermador range, microwave, Bosch dishwasher, 27-bottle wine cooler and extra deep sink with garbage disposal. The spa-like bath features a beautiful marble topped walnut vanity, an oversized soaking tub, Italian porcelain walls and floors, and basalt stone accents. The spacious master bedroom has three show-stopping windows and two closets. Rounding out this pristine home is a Bosch washer/dryer, Nest controlled heating/cooling system, 5-inch wide fumed oak flooring, 9.5-foot ceilings and window treatments. Beyond that, the N unit shares no common walls for maximum quiet and privacy. And separate private storage is included. 205 Water Street is one of the areas premier condominium developments. Mere steps away from Brooklyn Bridge Park, with iconic city and bridge views, Brooklyn's best boutiques cafes, galleries, theaters, and dining. Not to mention ample transportation options. Shared amenities include full-service staff with 24-hour doorman, resident manager, landscaped courtyard, in-building parking garage, second-floor terrace, indoor lounge with bar and media area, fitness center, bicycle storage, refrigerated storage and laundry room.